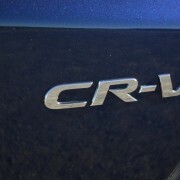 The big news for CR-V fans this year is the 190hp turbo motor which is connected to a CVT transmission. 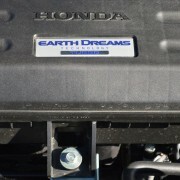 This four cylinder engine is above all fuel efficient, producing an overall EPA rating of 29 MPG (27 MPG City/33 MPG Highway). 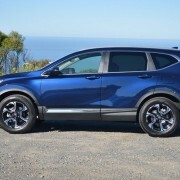 How does Honda manage to make such a small displacement unit propel a fairly substantial vehicle (3,530 lbs.) so economically? They massage every aspect of the fuel combustion process, with double overhead camshafts operating 16 valves, and high pressure direct fuel injection metering precise amounts of gasoline into all four turbocharged cylinders. 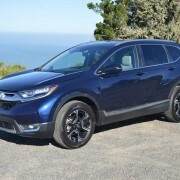 The continuously variable transmission (CVT) is one of the best on the market, with high and low ranges seamlessly administering “Real Time” thrust to all four wheels. 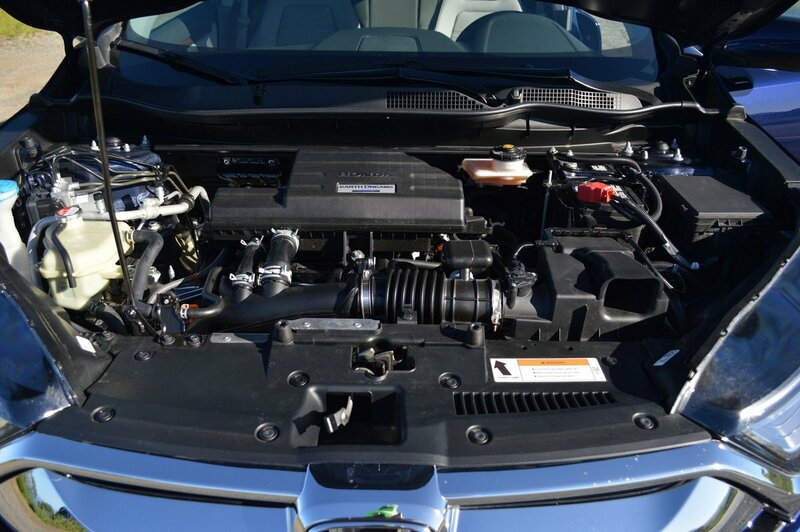 The only downside of the turbo 4/CVT combo is the engine’s maximum output of 190hp. That number comes up a little short in the outright performance department since each horsepower is allocated 18 pounds to motivate. 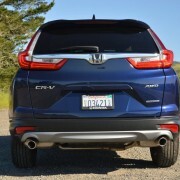 The latest CR-V isn’t slow once it gets rolling, but initial acceleration off the stoplight is uninspiring. 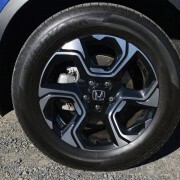 The Touring (TRG) version we tested is Honda’s top-line entry, with an all-inclusive price of $33,695. You can opt for a substantially cheaper $27,635 EX Front-Wheel Drive (FWD) version which will save you about $6,000 in outlay. But really, the Touring AWD version is well worth the extra investment if you do any long distance touring, or inclement weather driving. An eye-catching set of 7 inch x 18 inch flat-faced alloys make the CR-V look like its spinning its wheels even while standing still. Those rims are shod with Hankook Kinergy GT tires measuring 235/60 R 18. 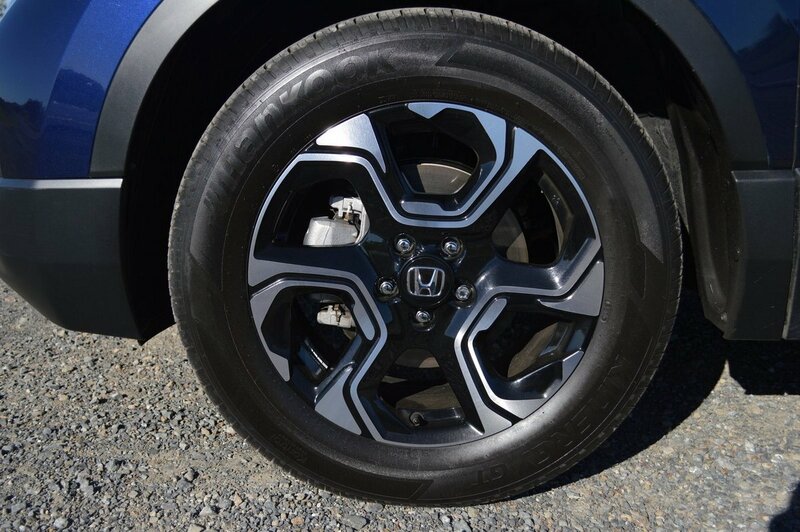 The 60 Series sidewalls of these radials impart a comfortable ride quality to the CR-V’s luxurious cabin. 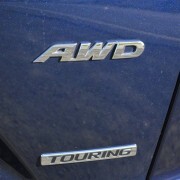 Their friction coefficient is also high, endowing this crossover with neutral cornering and decent grip on twisty roads. 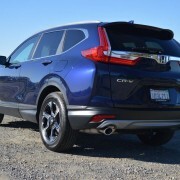 But you won’t be selecting a CR-V on the basis of acceleration or handling. 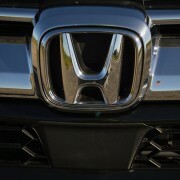 Rather, this Honda sells itself to you with its comfort, practicality and legendary build quality. 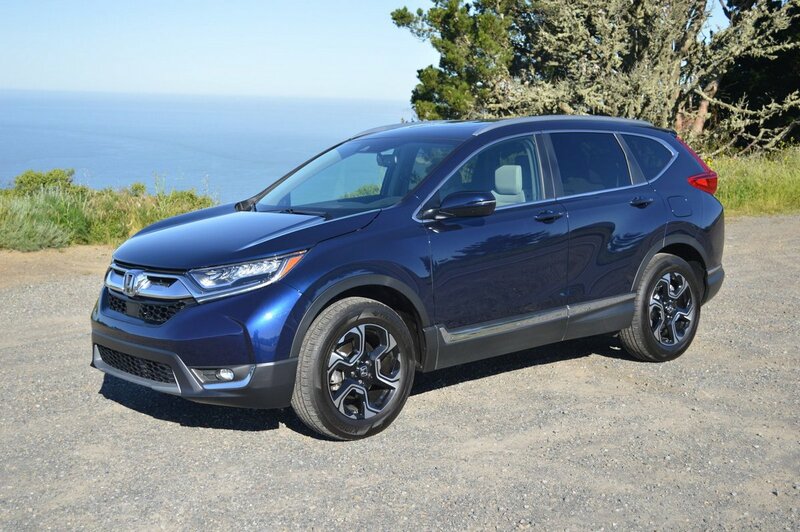 Though both the engine and transmission are constructed in the USA, the CR-V is assembled at Honda’s plant in Alliston, Ontario Canada. 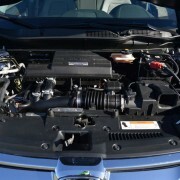 The Canadians do a workmanlike job of screwing the CR-V together with care and precision. We detected not one squeak or rattle from the complex structure, nor did we see a loose end here or a protruding screw head there. 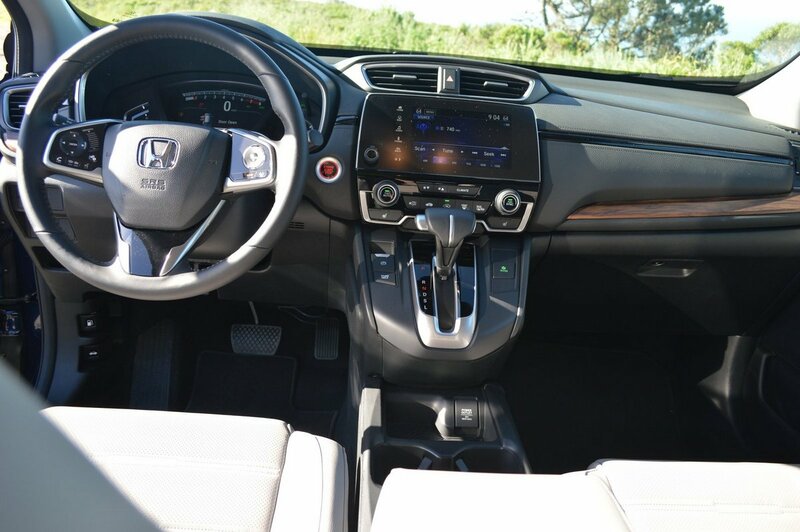 The interior of the CR-V looks more luxurious than you would expect from a vehicle in this price range. 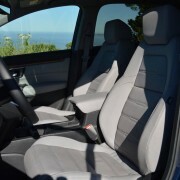 The heated front seats in particular are nicely done, with perforated, pleated leather offering lots of support and grip. The driver’s seat features a 2 slot memory recall, 4 step electric lumbar, and 12 modes of power adjustment. 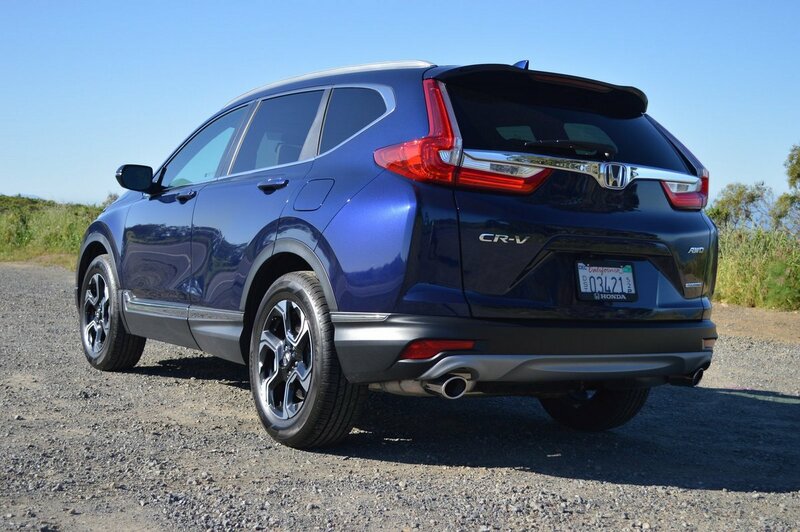 Although the CR-V has grown in size over the years, it still retains trim and athletic proportions, with an overall length of 179 inches and a compact wheelbase of just 109 inches. 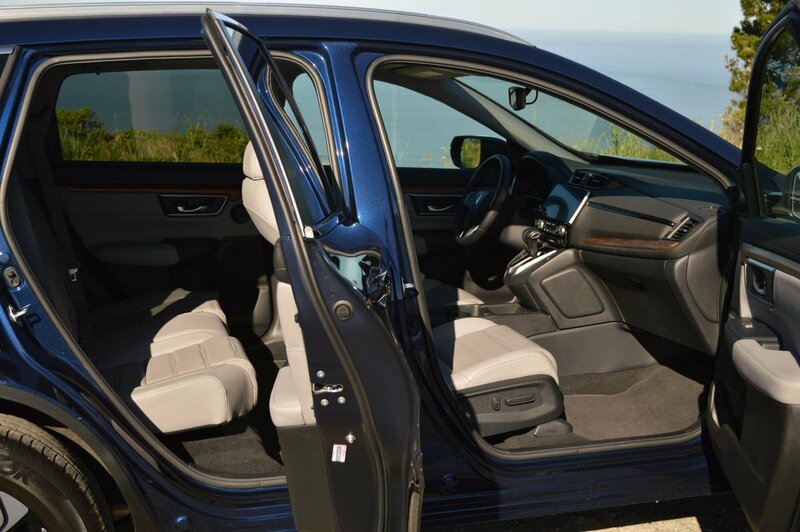 Until you flop the rear seats forward and remove the retracting luggage area screen, you don’t appreciate just how much interior space the CR-V affords you. With the seats stowed and the screen removed from its perch, you can slide a full size mountain bike over the low-threshold rear gate. 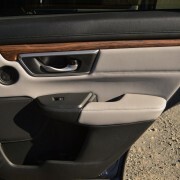 The Touring’s “Hands Free Access Power Tailgate” hastens insertion and removal of such large loads. 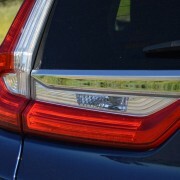 In fact, the CR-V will handle 36 cubic feet of cargo when properly configured. As a people mover, this SUV will carry 4 adults in comfort, five in a slight squeeze. 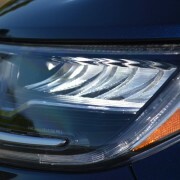 Of course, the top line CR-V is equipped with a full bevy of “Honda Sensing” safety measures at no extra cost. 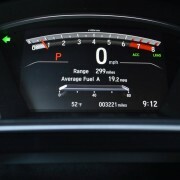 These include Adaptive Cruise Control, which is quite easy to operate from the steering wheel’s right spoke, and offers a particularly useful feature called “Low Speed Follow” which will ease your worry in stop-and-go traffic. Forward Collision Warning, Lane Departure Warning, Lane Keeping Assist and Road Departure Mitigation are all present and ready to help out in an emergency. 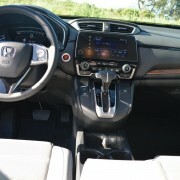 Only a couple of ergonomic misses mar the CR-V’s cabin. One is the floor-mounted stick shift’s lack of an illuminated adjacent display panel to reveal the gear range you have selected. You have to avert your eyes from the stick to find the appropriate display on the instrument panel. The steering wheel’s short range of vertical adjustment limits you to a bus-like driving position. 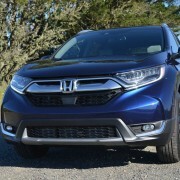 Finally, it’s difficult to see the front corners of the CR-V from the driver’s seat. That short list of misses hardly detracts from this exceptionally useful, all climate family utility wagon.